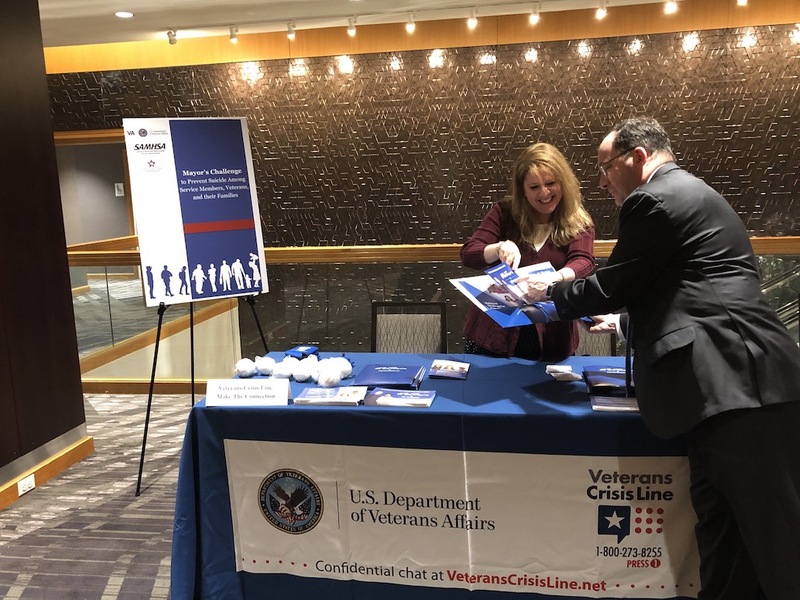 VA and the Department of Health and Human Services’ Substance Abuse and Mental Health Services Administration (SAMHSA) came together March 27-29 in Arlington, Virginia for the second annual Mayor’s Challenge to Prevent Suicide among service members, Veterans, and their families. The goal of the Mayor’s Challenge is to eliminate suicide by using a comprehensive public health approach to suicide prevention that empowers communities to take action. The Mayor’s Challenge brings participating cities together to form interagency teams dedicated to increasing suicide prevention resources for Veterans in their communities. In March 2018, VA and SAMHSA introduced the Mayor’s Challenge. Teams from eight cities met in Washington, D.C. to develop strategic action plans for preventing Veteran suicide in their communities. This year, VA and SAMHSA assisted five cities and two counties at a policy academy to build on the inaugural teams’ impact last year. This year’s policy academy participants included Mecklenburg County, North Carolina; Tulsa, Oklahoma; Oklahoma City, Oklahoma; Suffolk County, New York; Kansas City, Missouri; Clarksville, Tennessee; and Reno/Truckee Meadows, Nevada. All participating cities and counties were chosen based on Veteran population data, suicide prevalence rates and capacity of the city to continue the localized work of suicide prevention in the Mayor’s Challenge. Over the course of three days, leaders from the participating cities and counties created plans to implement the National Strategy for Preventing Veteran Suicide, which provides a framework for identifying priorities, organizing efforts and contributing to a national focus on Veteran suicide prevention. The Mayor’s Challenge included plenary sessions, customized workshops with subject-matter experts, and working sessions for teams to collaborate and identify priorities and action steps to prevent service member and Veteran suicide in their communities. Teams discussed a variety of topics including lethal means safety, safe messaging, suicide risk screening and assessment, peer support, community partnerships, and rural and faith-based initiatives. VA and SAMHSA will ensure the work is codified, evaluated for effectiveness, and shared with communities to help optimize the efforts of all partners and stakeholders committed to preventing suicide across service members, Veterans, and their families. For more information on SAMHSA’s suicide prevention efforts, visit https://www.samhsa.gov/suicide-prevention/samhsas-efforts. The health and well-being of our nation’s Veterans and former service members is VA’s highest priority. Guided by data and research, VA is working with partners, Veterans’ family members and friends, and the community to ensure that Veterans and former service members get the right care whenever they need it. To learn about the resources available for Veterans and how you can #BeThere as a VA employee, family member, friend, community partner or clinician, visit www.mentalhealth.va.gov/suicide_prevention/resources.asp. If you or someone you know is having thoughts of suicide, contact the Veterans Crisis Line to receive free, confidential support and crisis intervention available 24 hours a day, 7 days a week, 365 days a year. Call 1-800-273-8255 and Press 1, text to 838255, or chat online at VeteransCrisisLine.net/Chat. About the author: Aaron Eagan is the deputy director, operations and integration for suicide prevention, for VA’s Office of Mental Health and Suicide Prevention.